Simple, hearty, and satisfying – and entirely failproof in the crockpot. Perfect, even for baby! 1. In a large pot, heat 3 tablespoons oil over high heat until hot and shimmering. Add onion and garlic, and sauté until golden, about 4 minutes. 2. Stir in tomato paste, cumin, salt, black pepper and chili powder or cayenne, and sauté for 2 minutes longer. 3. Add broth, 2 cups water, lentils and carrot. Bring to a simmer, then partially cover pot and turn heat to medium-low. Simmer until lentils are soft, about 30 minutes. Taste and add salt if necessary. 4. Using an immersion or regular blender or a food processor, purée half the soup then add it back to pot. Soup should be somewhat chunky. 5. 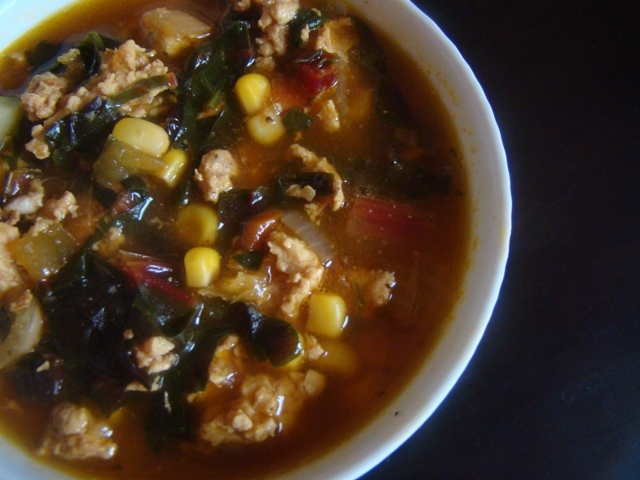 Reheat soup if necessary, then stir in lemon juice and cilantro. Serve soup drizzled with good olive oil and dusted lightly with chili powder if desired. 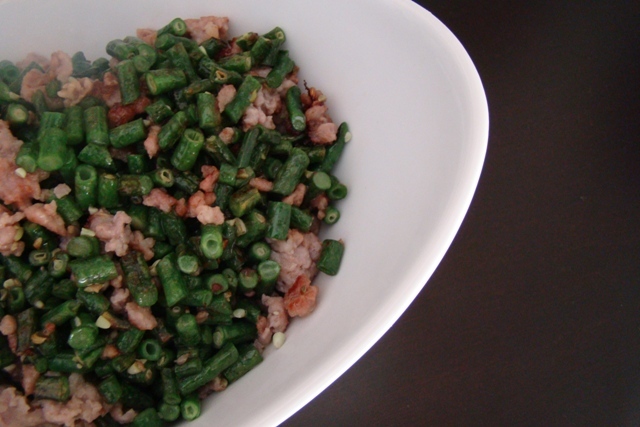 Two of my favorite comfort foods combine in this dish. With some leftover or store-bought chili, it comes together quickly and was my solution for dinner at the end of a busy, chaotic week. (Read: meltdowns and frequent night-time wakings from both kids.) Since the weather is still warm, we served it with a side of avocado, corn, and cucumber salsa for something cool. In a medium size bowl, mix together the corn and black beans. Place two toasted tortillas in the bottom of an 8-inch x 8-inch baking dish. 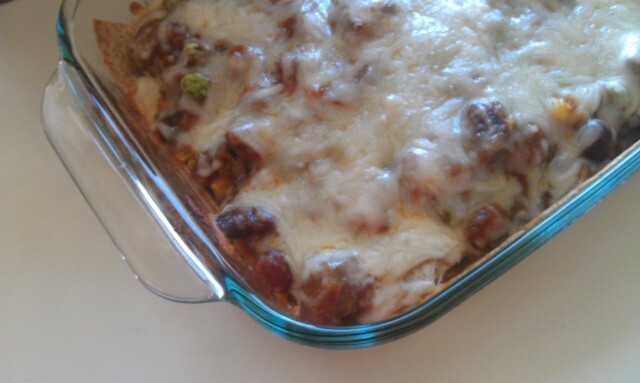 Top with one third of the corn/black bean mixture, one third of the chili and a handful of cheese. Repeat this procedure, layering tortillas, corn/bean mixture, chili and cheese. Top with remaining single tortilla and remaining cheese. Transfer to the oven for 20 minutes or until you see the sides bubbling. Garnish with cilantro. I know, it’s summertime. Not chili-time. But we have “cold” nights in Northern California and, really, I could eat chili with a side of honey-drenched cornbread most evenings. Certainly not the recipe you might expect to find at our place, which usually serves up lightened dishes with plenty of colorful vegetables and a dose of wheat or whole grain flour in anything baked. But, hey, we own also gelato stores and european patisseries. And we do all the R&D and taste-testing ourselves =) This recipe is decadent, meaty, hearty, and flavorful. Perfect comfort. Sometime in April, I suffered my first bout of mastitis from nursing Claire. No fun, let me tell you. I nursed Rice Kernel for over a year and a half (I didn’t intend to go that long, but that’s another story) with no incident. My OB even joked with me a couple months back that he was shocked I had never had an infection. Famous last words. This bowl is particularly thick....it was chilled and, hence, thickened. Chilled was good for mouth pain. For leftovers, I'd suggest thining with some stock, water or milk/cream/non-dairy milk. Heat the olive oil in a 4-quart saucepan over medium heat. Add the onion, celery, carrot, and a pinch of salt and cook until tender, about 5 minutes. Add the chickpeas and tomatoes with their juice, stir to combine, and cook for 1 minute. Tie the rosemary and bay leaf in a cheesecloth pouch with string. Add the herb pouch, 4 cups of vegetable broth, and 1 tsp. salt to the pot. Partially cover and simmer gently until flavorful, about 20 minutes, adjusting the heat as needed. Discard the herb pouch. 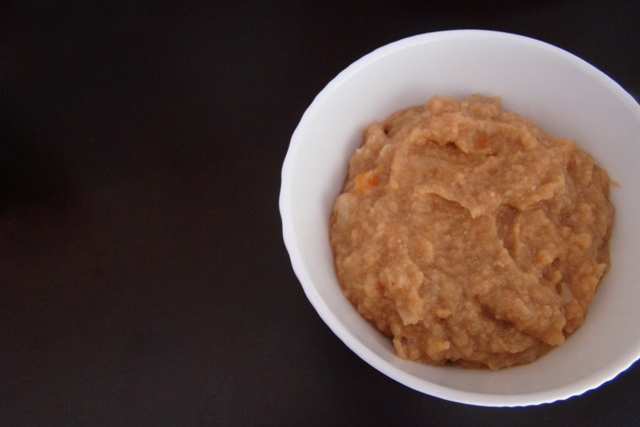 Purée the soup with a hand blender or in batches in a regular blender. Add additional broth if necessary. Divide the soup among 4 bowls. 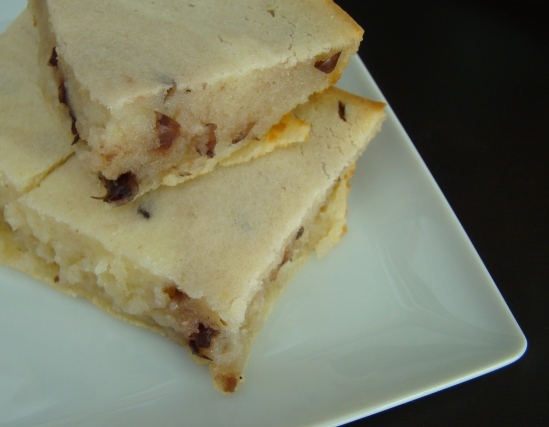 One of my favorite and easiest dump cake recipes is this one, a coconut mochi cake recipe. But it is a bit heavy, with two cans of coconut milk and a stick of butter. This recipe is far lighter, but just as addicting for the mochi-lovers in our family. At room temperature, the cake takes on its characteristic chewiness. When it’s warm, it’s softer and slightly gooey. While it will keep a few days, it is best eaten within a couple of days as the mochi will become harder. To reheat, simply toast in the oven for a few minutes. Note: We happened to have some red bean paste in the fridge (also long overdue), but I’m beginning to wonder if a similar-textured substitute could be used. Peanut butter anyone? 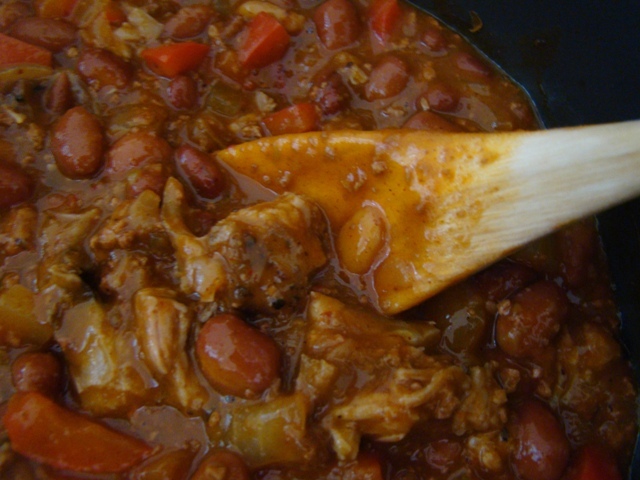 I love the flavors of chili, especially on a winter’s night. But I’m not always in the mood for red meat. This is the perfect compromise. For a twist, omit the beans and use 1-2 small new potatoes. In a large heavy-bottomed saucepan or Dutch oven, heat the oil over medium-high heat. Add the onion and cook until translucent, about 5 minutes. Add the garlic and cook for 30 seconds. Add the ground chicken, 1 teaspoon salt, cumin, fennel seeds, oregano, and chili powder. Cook, stirring frequently, until the chicken is cooked through, about 8 minutes. Stir the flour into the chicken mixture. Add the beans, Swiss chard, corn, chicken stock and optional green chilis (you can start with half the can and adjust spice later). Bring the mixture to a simmer, scraping up the brown bits that cling to the bottom of the pan with a wooden spoon. Simmer for 45-50 minutes until the liquid has reduced by about half and the chili has thickened. Season with salt and pepper, to taste. Serve with optional condiments.